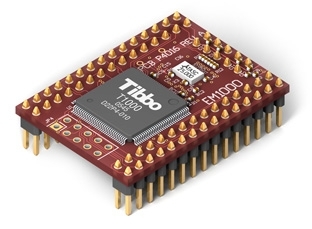 Small hardware changes were made to the EM1000 since its first release. 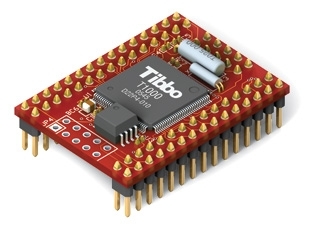 Currently Tibbo supplies version "-01" of the module. The first version ever produced was "-00". The main difference is in the Ethernet IC: the EM1000-...-00 used Davicom's DM9000 while the EM1000-...- 01 features newer DM9000A. This change reduced module's current consumption and operating temperature. Unfortunately, this transition requires certain alterations to the way Ethernet magnetics and RJ45 are wired to the module. Tibbo apologizes for any inconvenience caused! Throughout this document, differences between hardware versions of the module are highlighted in pink. Please, note that from the programming standpoint there are no functional differences between the EM1000-...- 00 and EM1000-...- 00. Pictures below show the original EM1000-...- 00 and the EM1000-...- 01.